The spectacular chandelier is made from fiber optics and retracts into the ceiling. I love chandeliers in opera halls, don't you? The curtain was made by hand by an artist in Argentina. Read all about it in the New York Times. 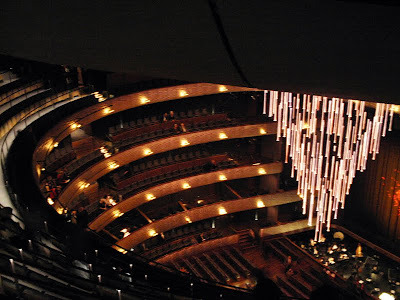 The new hall is an ideal place to see opera, although I would have made the aisles up in the highest tiers less treacherous -- at one point I almost toppled down. Also they need to mark the aisles and doors so that people can figure out where to go -- we spent a lot of time wandering around trying to find our seats. 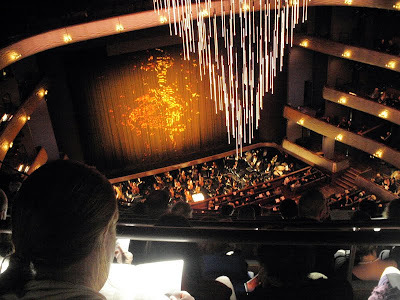 I wrote more about some of the details in the Winspear and the new Wylie Theater if you'd like to check out the October issue of Modern Luxury.